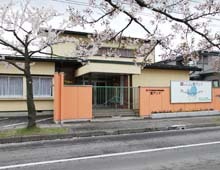 At Hachinohe Gakuin Junior College St. Anna Affiliated Kindergarten, “bright and healthy children,“the rich heart of children” and “children who have their own thoughts and ideas” are the educational goals. Together with Hachinohe Gakuin University, Hachinohe Gakuin Junior College, and Hachinohe Gakuin Kosei High School we strive for an educational lifestyle. In every day life of the kindergarten, Montessori education is the backbone which supports the relaxed playfulness of experiential learning, The teachers’ warmth and dedication to the students supports the overall growth of each child. With each activity, the children learn independence and to experience for themselves the challenges that await them, to feel satisfaction with their efforts while considering their actions on the world around them, and to become concerned and compassionate members of society.